About Us – Chocolates by Leopold, Inc.
Chocolates by Leopold is all about taste—the best tasting gourmet chocolates that you can find. Our chocolates are a mix of old-fashioned candy making and new approaches. 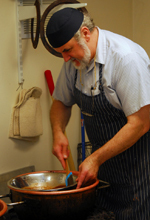 Our chocolatier, Leopold Schreiber, uses fourth generation German recipes for handmade candy centers. He also uses the lost art of starch-casting creams in a cornstarch infused with mineral oil. So our candy centers are creamy and flavorful with less sugar and no fillers. Our signature candy is Buttercrunch, a century old German butter toffee recipe handed down from master confectioner to master confectioner. We roast raw almonds in butter to give them an intense flavor. We then hand dip this center in chocolate and roll it in crushed almonds to create the perfect candy.